Creation on Earth is in crisis. Why then do we in the West continue in activities that are manifestly harmful to our lives, other peoples and other beings of the natural world? A large part of the answer is that we do not want to loose the comforts that we few million enjoy, which are bought at the cost to the billions who we know cannot rise to our life styles. At the centre of our behaviour, as a species, is the fundamental principle of ecological territoriality that is common to all life forms. With respect to human primates, this principle puts land at the heart of survival, first as hunter-gatherers meeting family needs, now as consumers of the products from the lesser economies of far distant places to satisfy our social wants. As a distinct body of knowledge, land and the ways that it is incorporated into culture for production defines the subject of natural economy. 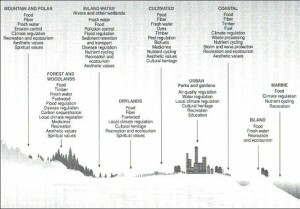 What follows was first written as an introduction to natural economy as a distinct body of knowledge, which in the 1980s was the first new school subject introduced into the UK examination system since the Victorian era. But it never caught on. The essay was written to raise the question posed above, and to point out that it was actually raised and answered at the very beginnings of industrialism. The answer then was that we require a value-based national curriculum, which cuts across specialized subject boundaries in order to wean ourselves off the ideology that we should live as if we could liberate ourselves from the bounds of nature. In his book, Land and Market, published in 1991, Charles Sellers describes the America of 1815, on the eve of a postwar boom that would “ignite a generation of conflict over the republic’s destiny.” Conflict between east and west, rural and urban, Native- and Euro-American, even farmer and wife, that resulted as “history’s most revolutionary force, the capitalist market, was wresting the American future from history’s most conservative force, the land.” Sellers describes a series of interactions between humans and the land, beginning with the subsistence economy of Native Americans. They were supplanted by Euro-American farmers who, in bringing their own village economy to the hinterlands, created an “intermediate subsistence culture.” In time that culture fell prey to the wider market in part because wheat and cotton booms made it profitable for inland farmers to grow and transport surplus crops to expanding urban markets. The outcome was that, eventually, the subsistence farming culture ran out of the cheap land it needed to maintain a reserve of production in order to sustain the family enterprises from one generation to the next. This is manifest in the former family farms of East Coast USA reverting to woodland. We are now well into the era of rural depopulation, which was beginning to spread worldwide when Sellers was writing. By the 1980s it had became clear to some educators that there was a need for a new subject dealing with the rapid pace of global urbanization which was the shifting power of production from the land to global business conglomerates. In particular, the international division of the University of Cambridge Local Examination Syndicate took the view that it was urgent to present a syllabus, which addressed the drivers of industrialism from which our ecological ills arise. The UCLES subject was called ‘natural economy’ because the knowledge framework we need deals with how biophysical resources of the planetary economy are organised for production. Therefore, the new subject has to be concerned with how the environmental impact of industrialism, and its sub-system of global consumerism, may be resolved for sustainable development. 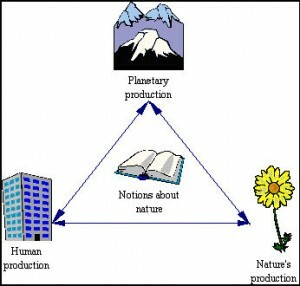 Natural economy complements the subject of ‘political economy’, which deals with how human societies are organised for production. It is linked to it through value systems; i.e. the notional economy, based on the flow of mental energy as ideas and beliefs about how society should be ordered for the greater good we define as living sustainably (Fig 1). Natural economy is a cross-curricular knowledge system which requires teaching resources that are holistic, and exemplify the cognitive leaps across subject boundaries necessary to put short-term plans for environmental improvements in the long term perspective of sustainable development. The term ‘polymath’ describes people who have the mental ability to make such connections. The other requirement is that the subject and its exemplars should be presented in a style that allows learners to navigate effortlessly through a sea of detail. An interactive computer format is essential to command a full understanding of natural economy and its applications to environmental management. Kingsley was an urban reformer, very much concerned in his novels, lectures and tracts, with relieving the ills of the urban masses that had migrated from the countryside. He was a Darwinian and enthusiast of applied science. Ruskin was a powerful educator who, in his writing on social reform, deplored the crushing influence of industrialism on art, morality, and the natural world. He saw the ‘land question’ as a matter of rapid population growth. Haggard was a rural reformer, who wrote with personal experience about land conflicts in the colonies, and the drift of people from the land. His diary of 1898 is a vivid month-by-month account of the life of a progressive farmer involved with the social problems of village, county, and the national scene. His stories reveal the mind-match that is possible between individuals of different lands, usually through a potent atmosphere of intrigue, violence and romance. A Victorian knowledge system cannot avoid incorporating spiritual notions, which provided the 19th century drive and justification for social change. In particular, the Victorians found themselves caught within a Biblical worldview of the origins and purposes of human existence. In this sense, religious belief was at the heart of all environmental problems, issues and controversies. John Ruskin’s writings are what we would now describe as a cross-curricular attempt to encompass the notional, utilitarian, and academic ideas about how we should value and use natural resources. His personal synthesis of religion and natural resources exemplifies the unusual breadth and depth needed to clarify and deepen our values and actions to meet today’s challenges of living sustainably. Ruskin’s standpoint was to interpret God’s plan for humanity, as set out in the Book of Genesis, in terms of the Creator giving Earth substance and form. 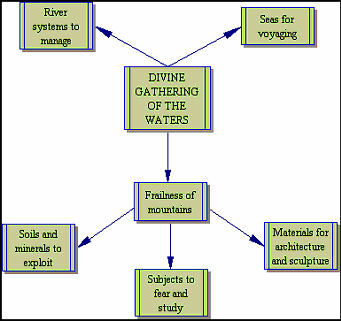 God willed functions into natural resources so that they may be used by His people to fulfill their divine destiny. He embedded in nature a divine blueprint for a natural economy, which organises the use of nature for production in conjunction with a local political economy. The necessary materials and energy were provided, as physical and biological resources, through planetary and solar economies. The former produces episodes of mountain building associated with Earth’s molten core; the latter governs weather and climate. These flows of materials and energy were set in motion following God’s ‘command that the waters should be gathered’, which produced the planet’s land-sea interactions. At this point Ruskin envisaged the Creator’s blueprint being realised through the denudation of mountains by rainfall. Starting from the divine ‘gathering of waters’ the human natural economy was dependent on the God-given ‘frailness of mountains’. This notion has been described as the synchronic mode of historical thinking. History is seen as a sequence of single moments set against the eternal truths of God and Nature in a supernatural conjunction. The first, and the most important, reason for the frailness of mountains is “that successive soils might be supplied to the plains . . . and that men might be furnished with a material for their works of architecture and sculpture, at once soft enough to be subdued, and hard enough to be preserved; the second, that some sense of danger might always be connected with the most precipitous forms, and thus increase their sublimity; and the third, that a subject of perpetual interest might be opened to the human mind in observing the changes of form brought about by time on these monuments of creation”. This quotation may be taken as an example of Ruskin’s philosophy that environmental features produce ideas, which are then confirmed by studying the features themselves. 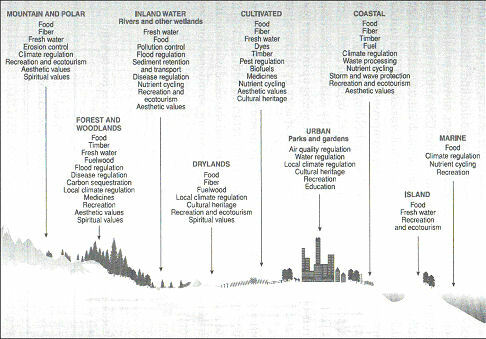 Ruskin’s holistic knowledge system relates human spiritual values of the Bible to our attitudes to, and use of, the land (Fig 2). For example, the Old Testament has several references concerned with the fruitfulness and flourishing of the planetary economy linked with ‘the finest produce of the ancient mountains and the abundance of the everlasting hills’. Other Victorian thinkers tended to slot into this framework. Kingsley and Haggard differed from Ruskin by giving more value to the processes and fruits of science, particularly as applied to industrialism. Charles Kingsley for example, was one of the first to articulate the science of ecology. He also probed into freshwater and marine biology, and was deeply involved with public health issues concerning the supply of clean water to disease-ridden towns and cities. Rider Haggard was personally involved with the more efficient use of land for agricultural production and forestry, subjects on which Ruskin had little to say. All three made practical proposals for social change to improve the lot of artisans and their families. However, as the 19th century progressed, Ruskin’s synchronic mode of history was giving way to the diachronic mode, in which history simply an irreversible sequence of events that occur one after another. His faith gave him a fixed system of God-given meanings that were unaffected by time. During his lifetime the supernatural eternal truths of Christianity began to disappear because the Church began to be seen more to become what today, most people would regard as a compassionate NGO. Ruskin’s big history based on divine creation has now been replaced by big history that begins with the ‘Big Bang’, which started the biophysical evolution of the universe. Ruskin and Kingsley were born in the same year, 1819, on the threshold of Victoria’s accession. Ruskin lived a quarter of a century longer than Kingsley, but had completed his major works by the time Kingsley died. In this perspective both writers were dealing with the problems issues and challenges brought about by unprecedented economic, social and scientific changes. Rider Haggard was born a few years after the great 1851 showcase of British industrial achievement displayed in the Crystal Palace, and his life followed this same historical trajectory. But, by 1860s, there were many signs that while sure of the past, people were becoming increasingly less optimistic about the future. Haggard arrived in Cape Town six months after Kingsley’s death, uncertain of his duties, but determined to make success of his opportunity to participate in the colonial administration of Natal province. As it turned out, although only there a few years, he was witness to what turned out to be the beginning of a loss of confidence in the Empire builders, which in South Africa led to the Boer War of 1899. If we place Haggard in the context of a continuity of generations from his boyhood in country society at the peak of the English squirearchy, his mother’s writings about the uncertainties of belief brought about by Darwinism, and the diaries of his daughter, who recorded the impact of the second world war on village life, we have a remarkable view of a century of social change. When he wrote this, Charles Kingsley was thinking about Devonshire, a notional attachment, which began in a real sense at Holne vicarage under the brow of Dartmoor, where he was born on 12th June 1819. This deep feeling for the hills, rivers and rocky coastline of the West Country was reinforced from1830, when his father was presented with the rectory of Clovelly. In between, and up to the age of 12, thirsty for knowledge, he was further magnetised by the large skies and luxuriant wildlife of fenland, to the east of Barnack, where his father held the living for six years. However, without doubt, Kingsley’s ‘homeland’ was the village of Eversley and its surrounding Surrey heaths. Here he began married life, little thinking that, with a short interval, it would be his home for thirty-three years. Here he applied his mind to heathland ecology, freshwater biology, and his life-long sport of stream fishing. He died at Eversley on 23rd January 1875. His relatively brief contact with the fens came out later in descriptions of what was in his boyhood something of a watery wilderness, although fast disappearing through the final stages of agricultural improvement. These youthful contacts with dykes and bogs were eventually synthesed with a strong sense of English history to author ‘Hereward the Wake’. Clovelly and its surrounding heritage of Elizabethan seafaring produced ‘Westward Ho!’, and evoked an abiding interest in marine biology. However, it was his day to day contacts with the lanes, fields and commons of Eversley that set him thinking about the geological forces that mould the nooks and crannys of a neighbourhood, and determine the development of its small-scale, and sometimes special, pattern of plants and animals. As Kingsley’s own educational model of a river system, ‘Water Babies’ incorporates all these points of view. Within a compressed industrial landscape the story expresses a biological and moral quest, which is literally carried along in the flow of a river system, from untainted uplands, supplying water power to northern mills, through an urbanised estuary, into a vast imaginary undersea world, as yet unaffected by industrial development. The subject of the centre light is the crowned and risen Christ bearing in His hand the world showing eastern hemisphere. On the pallium over his robe are seen the Serpent round the Cross, signifying the Crucifixion, the Keys of Life and Death, Adam and Eve denoting Original Sin and the need of Redemption and the Pelican symbol of Love and Sacrifice. On the left is St Michael, Angel of the Resurrection holding the Scales of Justice and a Flaming Sward. On the right is St Raphael, Angel of all Travellers bearing his Staff and girded for a Journey. Below in the centre is a view of Bungay from the Vineyard Hills. 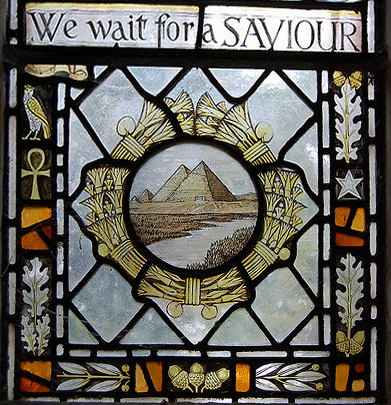 On the left, the Pyramids and the River Nile, surrounded by the Lotus Flower emblem of Egypt. On the right, Hilldrop, Sir Rider’s farm in South Africa. These views he loved and they illustrate three sides of his life, Rural, Creative and Imperial. Above in the upper lights are seen the Chalice, his Crests and Mottoes, and the Flame of Inspiration. 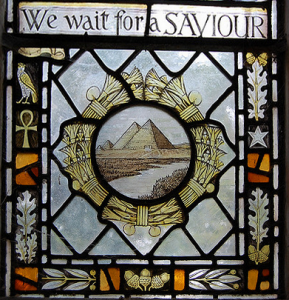 In the borders the Open Book, the Crossed Pick and Shovel and various Egyptian symbols, also Oak for strength, Laurel for fame and Bay for victory. Ditchingham and its neighbouring villages are metaphors for the fundamental aspect of the land question, which starts and finishes by way of arbitration of ‘how much belongs to whom’. Haggard literally lived on a boundary commemorating the disputed territory of two Saxon clans; the ‘North’ and ‘South’ folk claiming descent from the East Anglian ‘kings’ who’s Continental ancestors sailed up the shallow estuaries. Small-scale family feuds are written in the tortuous parish boundaries, which snake off in all directions around the parish church. From his agrarian base, amidst the flinty fields at edge of the ice-eroded East Anglian clay plateau, Haggard takes us via a ‘good read’ on real and imaginative excursions into the many facets of human nature. Through his factual reports, and the characters of his fiction, we may interact with the lives of farm workers, see the machinations of colonial administrators laid bare, sympathise with the victims of British imperialism, and enter alternative civilisations powered by supernatural forces. In this context, his life is an extraordinary effort to come to grips with the transiency of civilisations, and the individual lives that produce its cultures. Like Ruskin, but in his own way, he was using the gift of a powerful imagination to explore the ordering of human nature for a just and prosperous society, against the background of an apparently indifferent Universe. He proposed practical social reforms to cope with the former, which required political will to enforce. Till the end he thought the power of imagination might reveal invisible strands of immortality connecting the material cosmos with an infinite spiritual structure. Individuals, like himself, with this exceptional power would be the gatekeepers who could, for good or evil, draw aside ‘the curtain of the unseen’. “A still greater matter is the desertion of the land by the labourer. To my mind, under present conditions which make any considerable rise in wages impossible, that problem can only be solved by giving to the peasant, through State aid or otherwise, the opportunity of transforming himself into a small landowner, should he desire to do so, and thus interesting him permanently in the soil as one of its proprietors. But to own acres is useless unless their produce can be disposed of at a living profit, which nowadays, in many instances, at any rate in our Eastern counties, is often difficult, if not impossible. Will steps ever be taken sufficient to bring the people back upon the land; and to mitigate the severity of the economic and other circumstances which afflict country dwellers in Great Britain to such a reasonable extent that those who are fit and industrious can once more be enabled to live in comfort from its fruits P In this question with its answer lies the secret, and, as I think, the possible solution of most of our agricultural troubles. But to me that answer is a thrice-sealed book. I cannot look into the future or prophesy its developments. Who lives will see; these things must go as they are fated-here I bid them farewell”. “What I do hold a brief for, what I do venture to preach to almost every class, and especially the gentle-bred, is emigration. Why should people continue to be cooped up in this narrow country, living generally upon insufficient means, when yonder their feet might be set in so large a room? Why do they not journey to where families can be brought into the world without the terror that if this happens they will starve or drag their parents down to the dirt; to where the individual may assert himself and find room to develop his own character, instead of being crushed in the mould of custom till, outwardly at any rate, he is as like his fellows as one brick is like to the others in a wall? “Of late years there has been a great outcry about the closing of some of the Norfolk Broads to the public, and the claim advanced by their owners to exclusive sporting rights upon them. Doubtless in some cases it has seemed a hard thing that people should be prevented from doing what they have done for years without active interference on the part of the proprietor. But, on the other hand, it must be remembered that it is only recently the rush of tourists to the Norfolk Broads has begun. It is one thing to allow a few local fishermen or gunners to catch pike or bag an occasional wild fowl, and quite another to have hundreds of people whipping the waters or shooting at every living thing, not excluding the tame ducks and swans. For my part I am glad that the owners have succeeded in many instances, though at the cost of some odium, in keeping the Broads quiet, and especially the smaller ones like Ben acre, because if they had failed in this most of the rare birds would be driven away from Norfolk, where they will now remain to be a joy to all lovers of Nature and wild things. His other ‘home’ was the Swiss Alps, and his purchase of the lakeside estate of Brentwood in the Lake District was a logical decision about the question of where to spend the rest of his life, Switzerland or Cambria? Both lands focused his mind on two problems; the geological forces that produce cataclysmic upheavals in Earth’s surface, and the graphic depiction of mountains as landscape. He saw these fundamental questions, one of science, and the other of art, as two sides of the same coin. One aspect of his lateral thinking was to connect them through the budding science of meteorology, which had begun to classify weather patterns in using the shapes and distribution of clouds. In this context, Ruskin was fascinated by the beauty of ever-changing mountain skies which has a complex physical basis in the vertical temperature gradients and the relative instability of air flows. Ruskin made eleven trips to Venice during his lifetime. The first was made with his parents in 1835. In the winter of 1840-1, also with his parents, another tour included Genoa, Rome and Naples, as well as Venice, which he hailed as ‘a Paradise of Cities’. It is impossible to exaggerate the importance of Venice to Ruskin’s life, emotionally as well as intellectually. Initially seduced by its romantic beauty, as all English visitors are, he then chose to undertake a far deeper study of its art and architecture than anyone had previously attempted. Ruskin’s affair with Venice was also to give a social commentary that was to affect British life after his death in the guise of national insurance, national health, universal free education, the concept of ‘big history’ and even the National Trust. Why did not these anti-industrialism polemics feed into the British education system? The answer also deals with the failure of natural economy in the 1980s to replace geography and biology. Although at that time the UK education system was in the throes of the reform, which produced the national curriculum, it was part and parcel of the Thatcherite ideology. The values, which drove the political economy, were, as now, the objective of year on year increasing economic growth. Values for living sustainably have to be adopted before the education system will change to support the new ideology. We can contrast this with the teaching of the Native Americans who were living with no concept of economic growth and ecological principles, which will eventually catch up with the West in crisis. “We cannot separate our place on earth from our lives on the earth nor from our vision nor our meaning as a people We are taught from childhood that the animals and even the trees and plants that we share a place with are our brothers and sisters So when we speak of land, we are not speaking of property, territory, or even a piece of ground upon which our houses sit and our crops are grown We are speaking of something truly sacred. Even if nonhuman nature is regarded as the sort of thing, which can be owned, how can it be owned privately? How can one person take claim to land or other parts of nature? By what right does one person exclude others from parts of the earth? If it was not created by those who claim to own it, how can such a claim be legitimate? Although private ownership of the earth is now a common dogma, it was not at the outset of the capitalistic regime. Then the conception of nature as privately owned required justification”. Until institutions change to mirror better the economy of the biosphere and interconnected human values, the value-based national/international curriculum will never become a reality. Schools as institutions only mirror and complement the world within which they operate. Therefore, natural economy in the context of big history and similar educational innovations will become institutionalised only when culture is not compartmented into specialities and disciplines. You are currently browsing the Cultural Ecology blog archives for March, 2013.